We developed an automated algorithm in Google Earth Engine that takes any Landsat 5-8 image and extracts the location and width of the rivers in the image. It automatically flags instances where the calculated width could be inaccurate due to clouds, topographic shadows, etc., thus allowing the algorithm to be able to scale up easily. Validation against widths from over 200 USGS gauging stations shows promising consistency (38 meter root mean square error with an R2 of ~0.9). We are using this algorithm to create the first global multitemporal river width dataset, which can be used to understand the dynamics of river habitat, biogeochemical cycling, and flood modeling. Currently, we have finished calculating river widths for North America from over 8000 images. 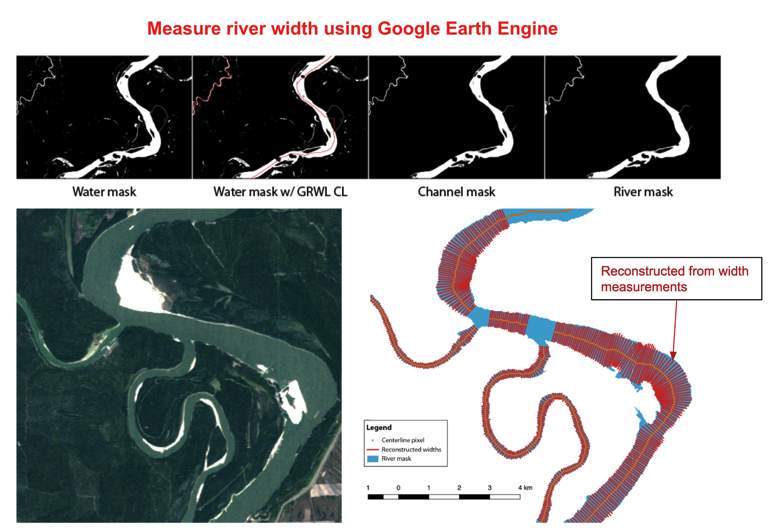 Our algorithm could have implications for automated river mapping at the large temporal and spatial scale using optical multispectral imagery. Besides river mapping, our algorithm can also be adapted to quantify the geometry of other linear features, such as historic river channels, geologic faults, or crevasse on ice sheets. The portability of the Google Earth Engine platform itself requires minimal setup for using these tools. The multitemporal river width dataset we are now creating will give us insight to the dynamics of the rivers globally. It could provide accurate and time-varying constraints for hydraulic and hydrologic modeling. It can also be used to help estimate river discharge using the recently discovered at-many-station-hydraulic-geometry (AMHG). We also plan to use it as an a priori river location and variability dataset for the upcoming NASA Surface Water Ocean Topography (SWOT) satellite mission. Being the longest consistent set of Earth observations from space, the Landsat data archive provides us with a rich scientific asset for investigating changes to the surface of our planet over the past five decades. In developing our algorithm, we benefit greatly from the reliability of Landsat data, both in its well documented metadata and in its highly consistent level of processing. To automate the workflow, our algorithm also utilized the rigorous and extensive research (like the Fmask for cloud classification) that has been conducted using Landsat products. After reconstructing the morphodynamic history of rivers globally from 1984-2013, do you have plans to extend the mapping of river dynamics into the future time-wise (2014-2017+)? Yes. We have already incorporated the processing of Landsat 8 data into our algorithm. And we have plans to adapt our algorithm to be able to process the later Sentinel-2 A/B datasets. 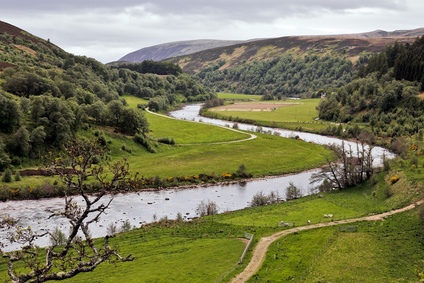 We also have plans for our algorithm and the associated multitemporal river width dataset to be extended to future satellite missions like Landsat 9, in order to maintain a temporally continuous global river width dataset. An illustration on how our river width algorithm works. The width measurements at the confluences of the river are intentionally left out of the last figure as the cross-section of a river at the confluence is ambiguous, however, we do keep all the centerline locations in our dataset. GRWL stands for Global River Width from Landsat dataset (Allen and Pavelsky, in prep). CL stands for centerline. Image credit: Yang et al. Funding provided by NASA Surface Water Ocean Topography mission. This entry is filed under News, Q&A, Water.